Aloe Vera (Aloe Vera Syn. A. Barbadensis) other names: Aloe africana, Aloe arborescens, Aloe barbadensis, Aloe Capensis, Aloe ferox, Aloe frutescens, Aloe Gel, Aloe indica, Aloe Latex, Aloe Leaf Gel, Aloe natalenis, Aloe Perfoliata, Aloe perryi, Aloe spicata, Aloe supralaevis, Aloe ucriae, Aloe Vera Barbenoids, Aloe Vera Gel, Aloe vera, Aloes, Aloès, Aloès de Curaçao, Aloès des Barbades, Aloès du Cap, Aloès Vrai, Aloès Vulgaire, Arborescens natalenis, Barbados Aloe, Burn Plant, Cape Aloe, Chritkumari, Curacao Aloe, Elephant's Gall, Gel de la Feuille d’Aloès, Ghee-Kunwar, Ghi-Kuvar, Ghrita-Kumari, Gvar Patha, Hsiang-Dan, Indian Aloe, Jafarabad Aloe, Kanya, Kumari, Latex d’Aloès, Lily of the Desert, Lu-Hui, Miracle Plant, Plant of Immortality, Plante de l’Immortalité, Plante de la Peau, Plante de Premiers Secours, Plante Miracle, Plantes des Brûlures, Sábila. 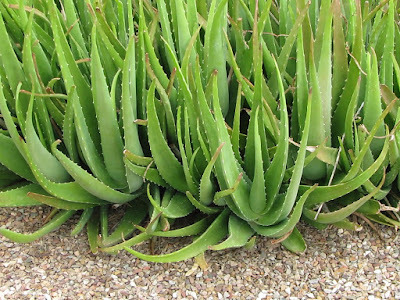 The mucilage or the aloe gel finds different uses as an herbal medication; it is used both as a topical medication as well as an internal herbal remedy for its ability to heal wounds. Furthermore, the gel is also used as a general herbal tonic or cure-all in the treatment of many different disorders and conditions. As such, the gel forms the main herbal product derived from the aloe product that is widely incorporated in a vast array of non-laxative medications and it also finds use in different cosmetic products all around the world. As mentioned before, the latex or juice of the aloe, which is usually used in the dried form, is also used extensively as a potent cathartic during herbal treatment. The product quality is not always the same as the mechanical separation processes which are utilized during extraction may not be very effective and result in impure products. The poor quality of processing of aloe sometimes result in the contamination of the aloe gel with the aloe latex, this results in an unwanted laxative effect within the so-called gel when it is consumed by patients. The problem is further obfuscated by ignorant advertisements made by marketing copywriters who often cannot distinguish between aloe gel and aloe juice, and very often the word aloe juice is used to describe the thin mucilaginous aloe gel-this has very disastrous results as the two products have very different properties inside the body. Aloe vera produces two substances, gel and latex, which are used for medicines. Aloe vera gel is the clear, jelly-like substance found in the inner part of the aloe vera plant leaf. Aloe vera latex comes from just under the plant's skin and is yellow in color. 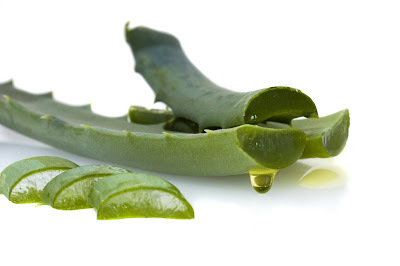 Some aloe vera products are made from the whole crushed leaf, so they contain both gel and latex. The aloe vera that is mentioned in the Bible is an unrelated fragrant wood used as incense. Aloe vera medications can be taken by mouth or applied to the skin. Aloe vera gel is taken by mouth for osteoarthritis, bowel diseases including ulcerative colitis, fever, itching and inflammation, and as a general tonic. Aloe vera is also used for stomach ulcers, diabetes, asthma, and for treating some side effects of radiation treatment. But most people use aloe vera gel topically, as a remedy for skin conditions including burns, sunburn, frostbite, psoriasis, and cold sores. 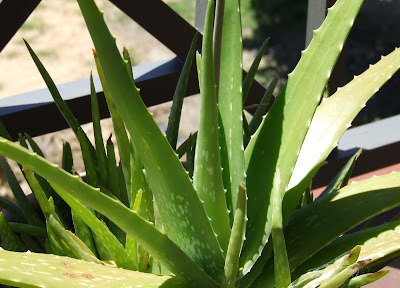 Some people also use aloe vera gel to help surgical wounds and bedsores heal faster. There is some science supporting these uses. Some chemicals in aloe vera gel seem to be able to increase circulation in the tiny blood vessels in the skin, as well as kill bacteria. Together, these effects suggest that aloe vera gel might be effective in speeding wound healing. But it’s too early to come to that conclusion. Evidence is contradictory. One study suggests that aloe vera gel may actually delay wound healing. Some people take aloe vera latex by mouth, usually for constipation. Less often, aloe vera latex is used orally for epilepsy, asthma, colds, bleeding, absence of menstrual periods, colitis, depression, diabetes, multiple sclerosis, hemorrhoids, varicose veins, bursitis, osteoarthritis, and glaucoma and other vision problems. But taking aloe vera latex by mouth is likely unsafe, especially at high doses. There is some concern that some of the chemicals found in aloe vera latex might cause cancer. Additionally, aloe vera latex is hard on the kidneys and could lead to serious kidney disease and even death. Aloe vera gel is likely safe when applied to the skin and possibly safe when taken by mouth in adults. Once in a while aloe vera gel might cause burning and itching of the skin. Taking aloe vera latex is possibly unsafe at any dose, but likely unsafe when taken in high doses. Aloe vera latex can cause some side effects such as stomach pain and cramps. Long-term use of large amounts of aloe vera latex might cause diarrhea, kidney problems, blood in the urine, low potassium, muscle weakness, weight loss, and heart disturbances. Taking aloe vera latex 1 gram per day for several days can be fatal. There have been a few reports of liver problems in some people who have taken an aloe vera leaf extract; however, this is uncommon. It is thought to only occur in people who are extra sensitive (hypersensitive) to aloe vera. Pregnancy or breast-feeding: Aloe vera either gel or latex is possibly unsafe when taken by mouth. There is a report that aloe vera was associated with miscarriage. Aloe vera could also be a risk for birth defects. Do not take aloe vera by mouth if you are pregnant or breast-feeding. Children: Aloe vera is possibly unsafe for children when taken by mouth. Children younger than 12 years old may experience abdominal pain, cramps, and diarrhea. Diabetes: Some research suggests aloe vera might lower blood sugar. If you take aloe vera by mouth and you have diabetes, monitor your blood sugar levels closely. Intestinal conditions such as Crohn's disease, ulcerative colitis, or obstruction: Do not take aloe vera latex if you have any of these conditions. Aloe vera latex is a bowel irritant. Remember, products made from whole aloe vera leaves will contain some aloe vera latex. Hemorrhoids: Do not take aloe vera latex if you have hemorrhoids. Aloe vera could make the condition worse. Remember, products made from whole aloe vera leaves will contain some aloe vera latex. Kidney problems: High doses of aloe vera latex have been linked to kidney failure and other serious conditions. Surgery: Aloe vera might affect blood sugar levels and could interfere with blood sugar control during and after surgery. Stop taking aloe vera at least 2 weeks before a scheduled surgery.